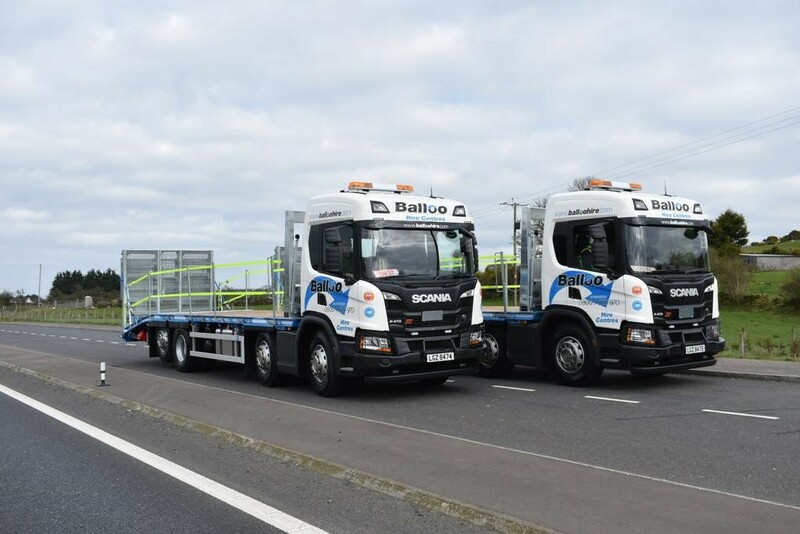 One of Irelands leading plant, tool, equipment and powered access hire companies, Balloo Hire Centres has expanded their delivery fleet with a large investment in Scania XT P410 trucks, supplied by local dealer Road Trucks Ltd, bodies by Sterling GP and Palfinger Loader Cranes from TH White. Over the past few years Balloo Hire Centres have heavily invested in new and more fuel-efficient transport to ensure all aspects of plant and equipment is delivered to customers effectively, efficiently and to the highest environmental standards. Balloo Hire Centres will take delivery of three Scania XT P410 -series, 32ton rigid vehicles in April. The new P-series provides excellent fuel efficiency and driver comfort and allows Balloo Hire Centres to reach customers working in the most demanding environments such as off-road, quarries and mines. Key features of all Scania XT models are an all-new heavy-duty bumper which extends 150 millimetres from the front of the cab with an improved approach angle and reinforced ribbed rear-view mirrors. Both features provide additional operational durability and combine to give all XT trucks a distinct and rugged visual identity. The bumper also incorporates an easily accessible towing device located behind the foldable registration plate holder. It is certified for 40 tonnes, enabling the vehicle to pull other vehicles and equipment as well as to be towed when needed. Other features include slip proof steps, Scania XT branded seats and high-edge rubber mats, and to further set the Scania XT range apart. Balloo Hire Centres has made significant investments in the past 12months, with 5 locations in the North of Ireland and 1 in the Republic of Ireland. They now have nearly 10,000 items in their range, across over 650 product lines. Established in 1987, from April 1st 2019 it is now part of the Briggs Equipment family.